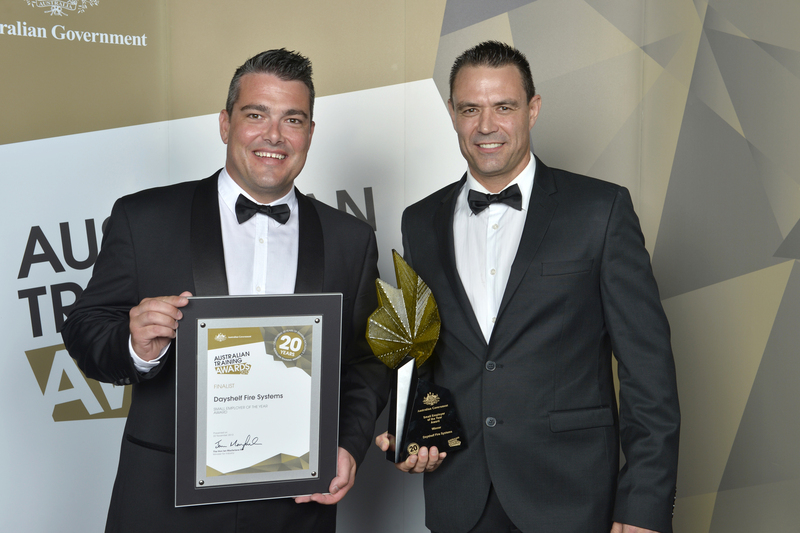 Gold Coast-based business, Dayshelf Fire Systems, has been recognised as the Small Employer of the Year at the Australian Training Awards in Perth, taking out the top honour for its unique training program and commitment to apprentices. It won the award, which recognises small enterprises that have achieved excellence in the provision of nationally recognised training to employees, ahead of Tasmanian company, Roadways, and Western Australian business, Barber Drilling. Dayshelf Fire Systems chief operations officer Darren Taylor said it was a coup for the company to be recognised on a national level. "To be named Australia's best small business trainer, against so many great companies right across the country, is a real achievement and recognition of the work we've put in over three decades to develop our training system," he said. "We have our own system that tracks and maps the training and licensing of all our staff to ensure we always deliver the highest possible standard of workmanship, giving clients the confidence their building is compliant."